My latest acquisition in the plastic camera stable is a Blackbird Fly TLR camera! I was very excited when it arrived, and even though it’s been a while, the excitement hasn’t worn off yet. Picture taking has become a healthy obsession for me, and it’s gadgets like these that keep it going. I’ll tell you all about my experiences with this new friend. It’s an experience unlike no other, and this camera shares almost nothing with other 35mm cameras I’ve ever seen before. A TLR is not a camera you want for snapshots, but rather for deliberate and thought out picture composition. It really makes you think about what you’re doing. I’ve had this little plastic gem for a couple of months now, having shot 5 rolls with it, and now it’s time for my honest opinion about this camera. At the time of writing (November 2009) it’ll set you back just under $130 (plus shipping from Holga Magic, Hong Kong) or £99 from the Photographer’s Gallery in Central London. Neat!It’s available in a variety of colours (see above). Mine is blue, but I was considering the pink version, which comes with a Masked Rider action figure (and is therefore more expensive so I didn’t get one). Like all TLR cameras, it sports a “flip-up and look down” viewfinder to frame up using the upper of two lenses, or you can use the “sports finder” to frame up at eye-height. The latter is just a cut out hole in the back flap so it’s far from accurate, but the “look down” one seems to make more than up for it: it’s bright and sharp, covering a full circle and shows your more than your film can record. There are some handy markings on the glass to frame up for any of your three picture options. Authentic TLR feel: frame up by looking down! TLR stands for Twin Lens Reflex (as opposed to SLR = Single Lens Reflex). It means you’ll frame up through one lens, and take the actual picture through another. 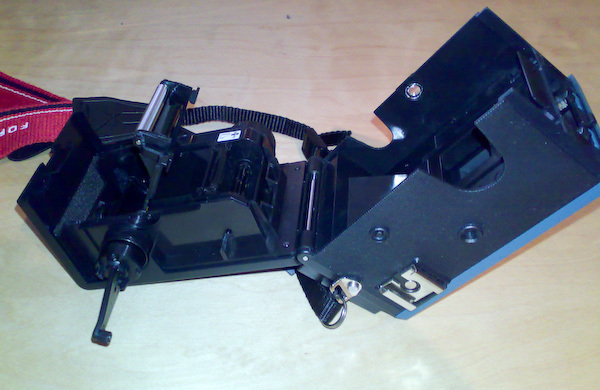 All TLR’s share one common problem though: what you see in the viewfinder IS NOT what your film sees. They have advantages too: you’ll be able to take candid shots more easily, because you’ve not got a camera in front of your face. Also, a TLR viewfinder does not black out while you take the picture (that’s great for long exposures). TLRs were popular before SLRs were invented, probably because it’s easier to build them than SLR’s. TLR cameras are usually Medium Format, like the Seagull, Rolleiflex and Mamiya, making the Blackbird Fly pretty unique. All TLR cameras share the “look down” viewfinders, which gives you a very different feel to the picture taking process, mainly because you’re framing much lower than with conventional cameras. However, the image you see in the viewfinder is flipped vertically, so it’ll take some time getting used to this: move the camera right and your picture moves left – and vice versa. It’s weird and wonderful alike! Check Wikipedia’s page about TLR Cameras for more information. 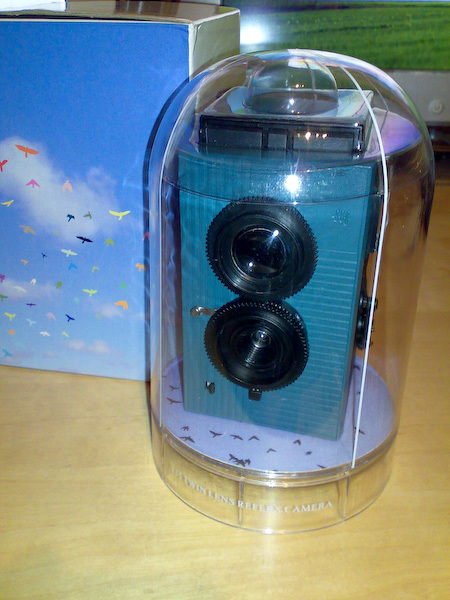 The camera arrives in a neat box, which contains a display case similar to a birdcage! It’s screwed onto the bottom plate, with an oval top above it. Even if you’re not taking your Blackbird out for a ride every day, it’ll look smashing in your display case. Not much should be out of focus then! I noticed you did some indoor shots… were they with floodlighting? I wish they’d offer a version at double the price with an F4 lens and visual focus ability. Thanks for the best review I’ve seen on it. You’re right about the focus range: only things very close to the camera – at the right distance setting – produce a blurred background. Other than that, it’s more of a “framing exercise” than a proper TLR I guess. If you’d like the focussing ability too, how about a Lubitel 166? You can shoot both 120 and 35mm with it (however it’s a bit heavier and of course more expensive). is it possible to shot horizontally? Yep, that’s no problem: all you need to do is turn the camera by 90 degrees. You’ll have to frame up using the sports finder rather than the top-down viewfinder. It’s not as accurate but will give you a guide of what will be in the picture. I was wondering what film does it use? The Blackbird Fly uses standard 35mm film. Developed and printed at every mini lab on the high street. Without a gate it exposes sprockets too.